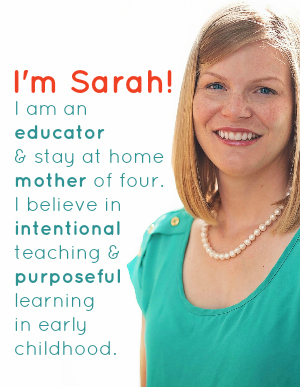 If you are a preschool teacher, you probably go through a lot of play dough. If you are a preschool parent, you probably go through a lot of play dough, too. It can get pricey, which is why you need this absolutely perfect no-cook playdough recipe without cream of tartar, and it really is…well…absolutely perfect. 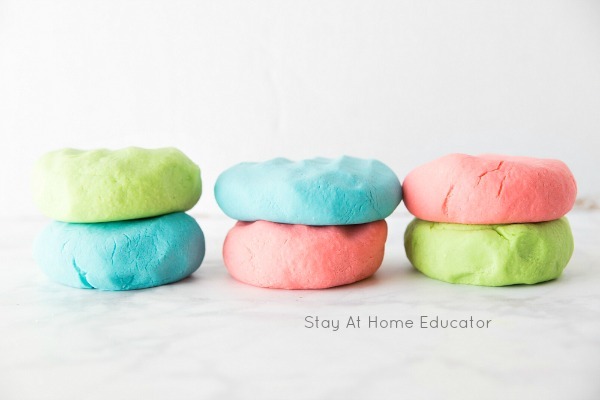 I love this play dough recipe because, not only is it quick and easy to make and smells delicious, but it’s also the perfect consistency for hand strengthening. Preschoolers need hand strengthening activities to prepare them for life skills. It also prepares them for learning the correct and mature pencil grasp. 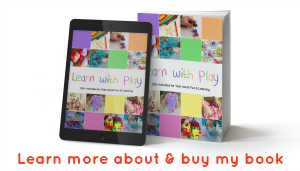 Playdough is also a great accompaniment to a variety of preschool themes and math activities. And, did I mention it’s cheap? I don’t know about you, but with the quantities of play dough made around here, cream of tartar can get pricey. Or, if you’re like me, you’ve used the last of it in your mom’s best snickerdoodle recipe and now you have none left for play dough. So, a play dough recipe without cream of tartar is a really valuable thing! This recipe does not call for cream of tartar to stabilize it, and the recipe doesn’t call for expensive extracts or essential oils for fragrance . Aside from this play dough recipe being so extremely affordable, the play dough itself really is just perfect. It is malleable, but not sticky, holds its shape beautifully, but without being crumbly. Other perks include the fact that this is a no cook play dough recipe, which makes it super fast and easy to make. This is easily our favorite recipe. Disclaimer: I have had my fair share of play dough fails. Remember this Facebook post of my failed red play dough that brought my sweet daughter to tears? Well, tears no more, because I’m also sharing some tips and tricks to making play dough perfect the first time! Measure the water and lemon juice into a heatproof, microwavable 2-cup measuring cup. Heat in the microwave until just boiling, about three minutes. Meanwhile, mix together the flour and salt. 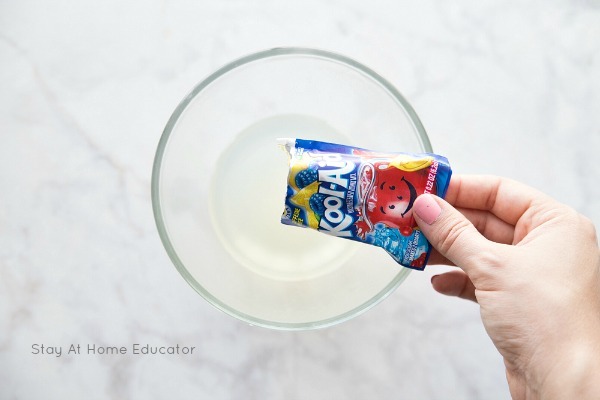 If using Kool Aid for the fragrance, slowly (and I mean s-l-o-w-l-y, because the mixture will foam a bit) pour the kool-aid packets into the HOT water and lemon juice mixture and add additional food coloring to intensify the color if desired. Slowly pour the liquid into the flour and salt mixture, and stir with a wooden paddle until it just barely begins to form a dough. Drizzle the tablespoon of cooking oil over the dough and stir again until it forms a ball. At this point, you may want to knead the dough with your hands. It may feel a bit sticky, too, but DO NOT add more flour. As the dough cools it will thicken and become less sticky. (Just like how gravy turns to sludge once refrigerated). Now, once the dough is completely cooled, you may add flour a tablespoon at a time until it is the perfect consistency. Allow the dough to cool a bit on a sheet of aluminum foil, parchment or wax paper. By the time you finish the next batch of play dough, the first will be cool enough to store. I love to store play dough in these freezer jam containers because the screw on lids are more airtight than snap-on lids. Now Play with that Scented Play Dough! My daughter took a giant whiff of blue raspberry lemonade scented play dough. 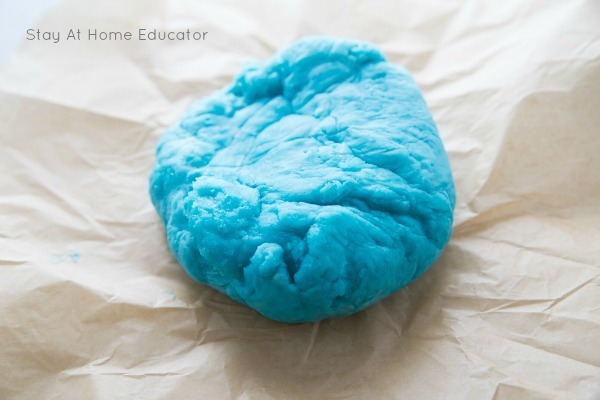 As far as a scented play dough recipe goes, the possibilities are endless! Literally. We made grape scented play dough. Apple scented playdough. Peach mango scented playdough. It’ll make your kitchen smell like a fruit orchard! (Or a Bath and Body Works shop). 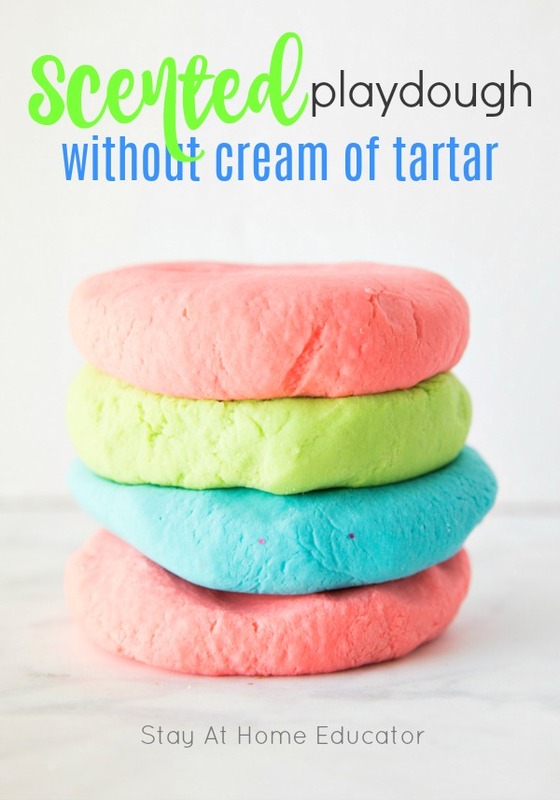 Do you have a favorite no-cook playdough recipe without cream of tartar? Perfect Edible Gingerbread Play Dough, and Cookie too! Wow! I’ve pinned it because I love it! I’ll use this recipe with my preschoolers. A million THANKS! I bet that it smells amazing! It really does, and because of the Kool Aid, each color has a different scent, which the students love! I’ve had playdough last for up to six months! But most recommend to get rid of it after three months. I can’t wait to make this for my Sunday school class. The recipe I have used for years calls for Cream of Tartar and is so expensive for as often as I need to make it. Thanks for sharing and God Bless your days. I have never had that problem. Try adding more flour a few tablespoons at a time. Knead well. I ended up using cornstarch and it’s better. Thanks for the response and the recipe! Glad you got it to work out! Smart idea to use cornstarch. I’ll remember that. Hi. I also had the same problem. After a long time, still so sticky! I’m using it in the classroom so any kind of stickiness won’t work. I tried without the koolaid and a bit of extra flour ( I used peppermint extract) and it came out perfectly, which leads me to believe that the koolaid is the cause of the stickiness. I saved my koolaid scented batches by adding almost triple the flour. It works then – maybe add a note in the recipe that adding extra flour maybe necessary after it cools. I’m so glad you commented and shared your solution. I really have had no problem with it, but I really appreciate you sharing how you saved the batch. And I will edit as you suggest. What a smart idea. Hi! Update: I used the playdough in the classroom today. The one with peppermint oil was perfect. The one in which I used strawberry koolaid and almost three times the flour to thicken was a mess. Ended up the consistency of frosting! You can imagine what a mess that is with 26 kids. The purple grape koolaid scented playdough ( which also used almost thrie the flour) was pretty good! So I don’t know why, perhaps the kind of koolaid I used was the culprit? All I know is, if you are a teacher and want to use it in the classroom, this is an awesome recipe if you use oils to scent it. 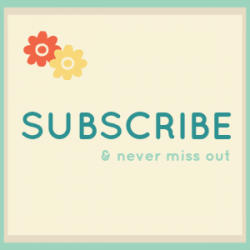 Beware of the koolaid batches……. I wish I could share photos of my students getting messy. In the end it was a success in that everyone had fun and it was a happy mess. Thank you so much for sharing your experience. Play dough can be so funny, sometimes! I also love to use essential oils in playdough. Ok, I have had this happen before. Did you let it cook completely? Just as flour makes a great thickener for a gravy, you will not know the thickness until the gravy is completely cooled. So, if yours turns out sticky, it may be because it didn’t have time to set up. This worked amazingly well. I swapped out the kool aid/food coloring for a water flavoring product that had a lot less ingredients (so I felt better about using it). Not as cost effective, but it was a personal preference. Thanks for sharing! Just made it and loved it. Made a few minor, if any modifications . Kid loved it. Thanks. Hello, what type of cooking oil should be used? Vegetable oil? Yes, I use vegetable oil, but really any kind of cooking oil will work the same. I have added literally cups of extra flour and it is still horribly sticky. Not only did I not save money, I ended up having to buy play doh because I had promised the preschoolers play doh. I will not recommend. I’m so sorry it didn’t turn out! I’ve honestly never had that happen. But, I can tell you that it will feel a little sticky at the beginning until the dough cools completely. It’s just like making a gravy. It will be it’s thickest once cooled completely. Thank you so much for sharing this. I have made countless batches of awesome cheap dough for my wee one. However for the first time ever I did manage to make a batch that was runny. I added small amounts of flour to correct the issue. After making so much of previously it I came to the conclusion that mixture discrepancy was probably an air pocket in my measure cup of flour and or just slightly higher than the line in my jug for the water. For others struggling I suggest not adding all the water at once. Leave a few tbsp in the jug and add as needed. Thanks for the tip, Victoria! 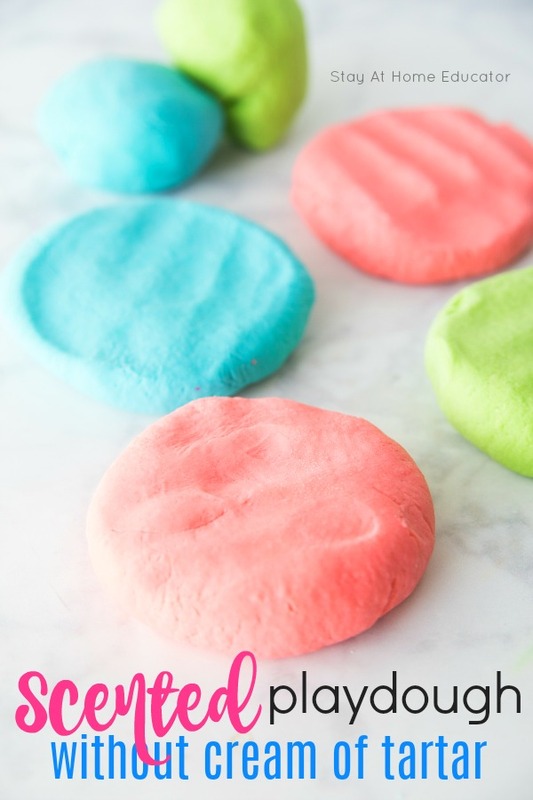 This is my go-to recipe, but I admit playdough can sometimes be finicky, especially if you’re like me and always have a lot of extra helping hands!